Kodur, Venkatesh K.R. ; MacKinnon, David H. (2000). 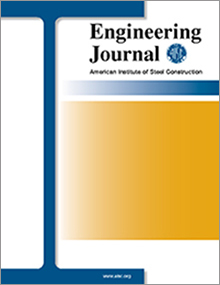 "Design of Concrete-Filled Hollow Structural Steel Columns for Fire Endurance," Engineering Journal, American Institute of Steel Construction, Vol. 37, pp. 13-24. The benefits of steel hollow structural sections (HSS) from an aesthetic and structural point of view have long been recognized by architects and engineers in Canada, and more recently in the United States. However, when building codes require structural fire protection, the cost of providing such protection can be expensive for exposed members. Filling an HSS column with concrete not only improves the capacity of the member through composite action at ambient temperatures but also provides fire endurance periods of up to 3 hours depending on the load level, section size, concrete strength and reinforcing characteristics. Physical tests and parametric studies recently completed at the National Fire Laboratory in Ottawa have resulted in design equations which predict the load carrying capacity and fire endurance period of concentrically loaded HSS columns filled with plain concrete, barrein forced concrete and steel fiber-reinforced concrete. The design method is presented, case studies are used to illustrate potential applications, and practical suggestions are made regarding construction techniques.